Departure from Fethiye Harbour between 11 and 12 a.m. to Samanlik Bay for swimming - lunch or depending on the sea conditions to Butterfly Valley for lunch, a swim - optional visit of this natural reserve, hosting 136 kinds of different butterflies and moths. Last stop of the day is St.Nicholas Island. Byzantine ruins, swim, dinner. 1st night. Cruising to Kas where we stop in the harbor for lunch - visit of this charming fishing village. Of ancient Antiphellos, as Kas was once known, only Lycian rock tombs - sarcophagi and the Roman theatre are left. But the charm of the town remains! Breakfast. Departure to Sunken City of Kekova (this Lycian-Roman archaeological site is protected, so only looking!) Lunch. After breakfast we have a look at the Pirates Cave (sea conditions permitting) before cruising to Andriace harbor (lunch). • In case of poor weather and/or sea conditions, this program is subject to change without notice. No money will be refunded. 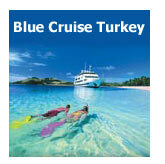 • Cabins on Turkish Gulets are for 2 or 3 persons. Single supplement is not available, single passengers will share or need to pay double to get a private cabin. • Transfer from your hotel in Fethiye to the boat. • All meals (Breakfast / Lunch / Afternoon Tea, Coffee, Biscuits / Dinner), fuel, harbor fees, service. • Standard yacht equipment, board games, snorkels - masks, fishing lines. • Passengers may bring snacks, such as fruit, nuts, muesli, yoghurt, chocolate..
• Taxes and handling services.